Interact with Commerce on the social media sites you already use every day. whitehouse.gov/open - Learn more about the President's efforts to increase transparency, participation, and collaboration throughout government. Data.gov - Access and discover new uses for the range of data produced by the federal government from one central location. BusinessUSA.gov - See the "no wrong door" approach for small businesses and exporters. FOIAonline - See the the start of a new era for the Freedom of Information Act within the Department of Commerce. On January 18, 2011, in Executive Order 13563, the President directed each agency to review their "existing significant regulations, and consider how best to promote retrospective analysis of rules that may be outmoded, ineffective, insufficient, or excessively burdensome, and to modify, streamline, expand, or repeal them in accordance with what has been learned." In response to this directive, Commerce created and released a preliminary plan for review of its regulations on May 26, 2011. 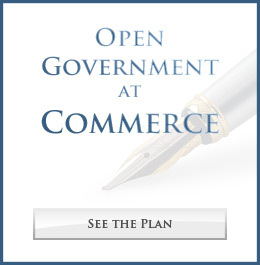 Commerce welcomes the public's comments and feedback on this preliminary plan. Please send your comments to open@doc.gov with "EO 13563 retrospective plan" in the subject line of the email. We will accept comments until midnight on July 25th.